OK, So I have been combing the for sale adds and the auto salvage yards for a Ford ZF 5 spd that fits a small block and is a 4X4 unit. Yeah, right up there with finding the Golden Egg!!! So, I located a np205 divorced box with the right hand drop! Score!!! I walked away with my $550 still in my pocket. I did pick up a ZF 5 spd 2wd trans today so it wasn't a total loss. I'll clean it up and get some pic's tomorrow. Blitz, I have a line on hose cabinet hose. just trying to track down the owner for a face to face. I could have used another 100 feet today. A couple Hundred feet would be great. I need something I can drag around and not worry too much about dirt and "clipping it back onto the racks". Could have used that Firehose to flush out the septics also..
Got it fixed, but didnt want to drag out my clean hose, to flush a septic :*(. Last edited by Blitz; May 8th, 2015 at 10:45 PM. Divorced 205s are outrageous! $850 seems to be the average now. I've settled on keeping the NP200 for now on mine. that was last month, I can check to see if it's still available. Oh, that was easier to look up than I thought it'd be... I forgot he sent me a link to the ad. It was NORTH Carolina... but he's actually in TN.. and $500 for the IH. He hasn't updated to indicate if he's sold the IH unit, but there's a phone # listed. If you are not going with the original 5.88s, the NP200 should be fine. I've run two for years, one with 3.73s breaking 100MPH and never had any problems. ... no thanks! I've got enough reminders of my mortality without going 100 MPH in an M715. I got my truck to 60 MPH once with the 230 in it... down hill and a tail wind... and that was scarier than 120 on my Harley in traffic. Yeah, I'm still going to be running stock gears. Stock size tires. I'll just be happy with 55ish for a while. You might check with Moonshine Mafia Motorsports. That is where I got my divorced 205. He also built my doubler. I don't know what his prices are now for a divorced unit, but I think I paid $550 for a totally rebuilt unit a couple of years ago. The thing looked like brand new. Here is a link to his Facebook. Von, That one was already sold... But thanks for the heads up on it! Troop, Thanks for the link. I sent them a message so now it is "sit and wait". Blitz, I got a line on hose and am tracking it down. Should know more by the weeks end. Now I know why I dislike "mail order parts". Description was wrong so I got the wrong plug wires the first time. Called the vendor and they shipped out a new set. Still incorrect. So I am sending back the plug wires, distributor and coil and getting a different distributor that takes std Ford wires. This has given me time to think about this build and discuss it with my son. The aim is to be able to drive the truck to Moab for the Easter jamboree in 2016. With that being the aim, I'm going to go ahead and scrounge for newer axles. 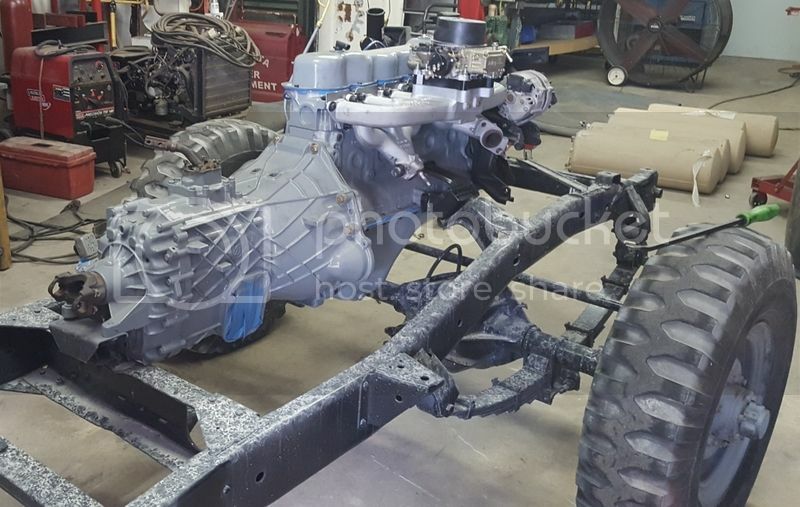 I want the direct bolt in units so it will be a Ford D60 with high pinion and that changes the T-case to a left side drop. I have found a D70 still in a chevy 3500 van with DRW's. Thats a good ting. Now I just gotta get the current owner to sell the thing. With the 8 on 6.5 bolt circle, I'll be going with 17" wheels and running the 37 X 12.50 17 tires. With the spring over, shackle flip, tires and a set of lockers with 5:13 gears, it should make a sweet trail rig. 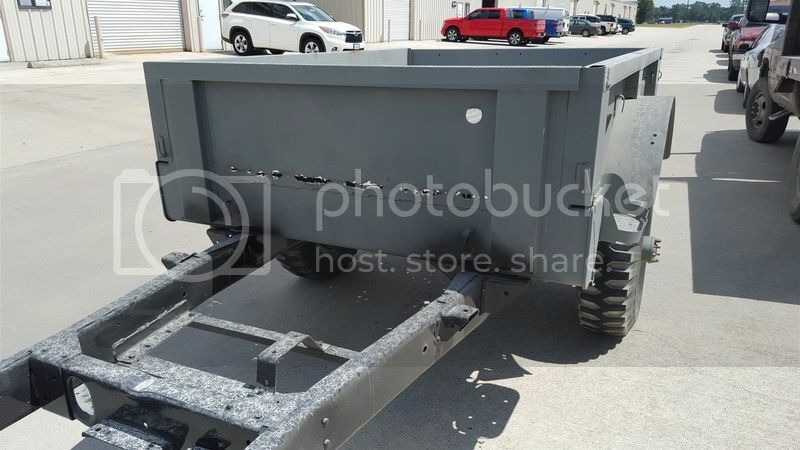 I like what 4X4 TV is doing with that truck by shortening the rear of the bed but I'm not sure i want to "copy" what he did.... Still thinking about this. The ZF trans had dual PTO openings and I just happen to have a PTO and dual hyd pump. I'm making plans for front and rear hyd winches mounted up under the truck so I don't loose approach angle. So, I finally got the chassis back and got the engine and transmission sitting in the frame. I've got a lot of work to do to build mounts for the transmission and transfer case. 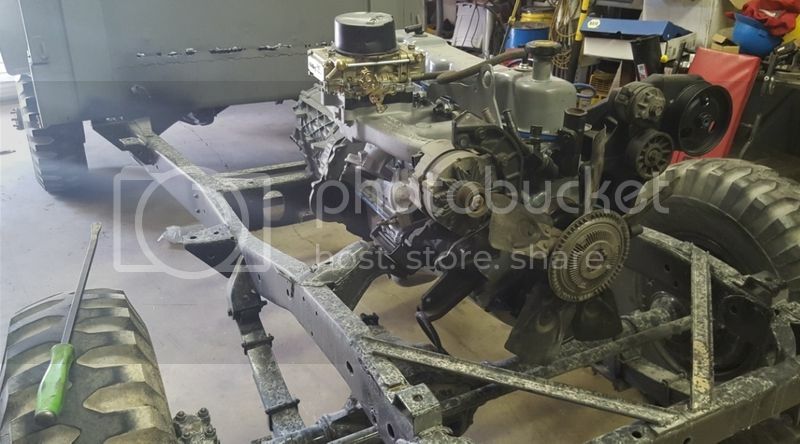 I found an NP205 divorced unit from a Dodge W100 and it looks to be challenging to build mounts for it. I let my son talk me into putting headers on the engine. Dropped the cash for the headers and after wrenching in 3 bolts by hand.... I then noticed I will have to remove them if I replace the starter! There is about 4" clearance from the lower header pipe to the front diff. So, I decided to upgrade the axles to the newer 8 lug pattern. I found a Ford D60 front that bolted in as a spring over. WOW, that gave me a LOT of lift. I then searched but couldn't find a 14 bolt from a g30 but, I did find a d60 rear axle from a dodge that has the width needed for the 715. I had to move the mounts outboard to match the spring width but am happy with the overall fit. The rear axle had a track lok diff in it. I'm going to rebuild it and put side gears that are 35 spline so I can upgrade the axles. The front diff will get a new Detroit True track. Both axles will get 4:88 gears. Building these axles is putting a serious dent in the build budget!!!! !